Drag racing has been a popular form of auto racing, both to watch and participate. The NHRA Mello Yello Drag Racing Series is the top of the mountain in drag racing. 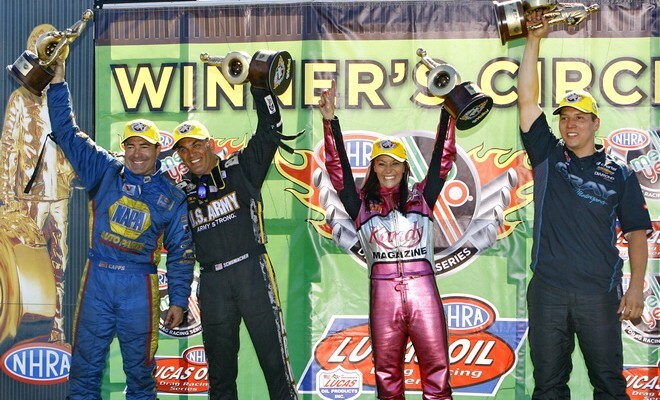 Four classes compete in the Mello Yello Drag Racing Series, top fuel, funny car, pro stock, and pro stock motorcycle. Each has their own unique uniform quirks. Let’s start with top fuel. Top fuel dragsters are 25 feet long, nitromethane powered and run 10,000 horsepower. While they are traditionally open cockpit, in recent years canopies, introduced by Tony Schumacher have come into style. 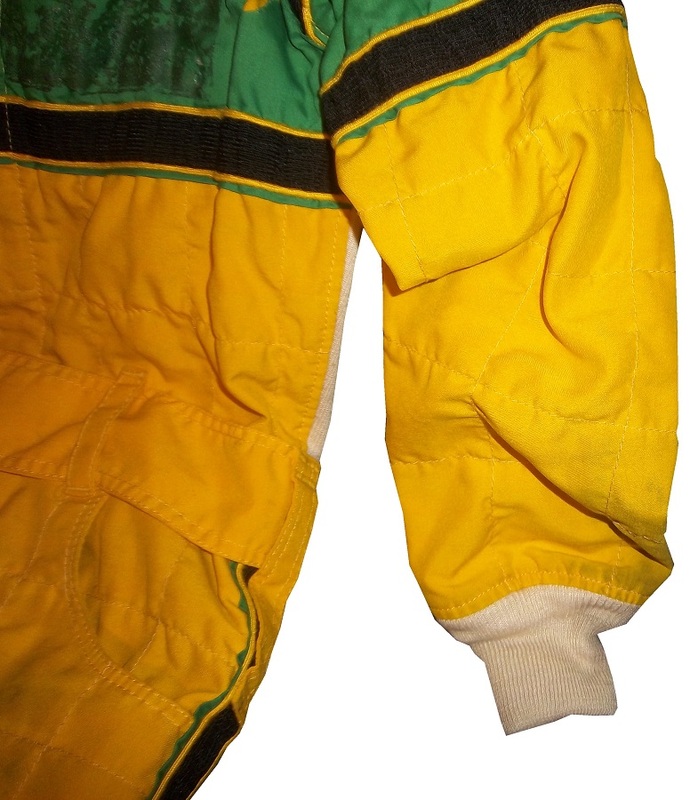 Schumacher said that when he drives, he wears a 5-layer suit, with two layers underneath that. As the fuel tank is at the front of the car, and the engine directly behind the driver, this style of suit is very necessary. He also wears the older sunglasses style visor, as does TJ Zizzo. I bought this visor from TJ and asked him why he has as much of it blacked out as he does. He explained that when he is in the car, he needs to focus as much on the track as possible, and it’s easy to get distracted. 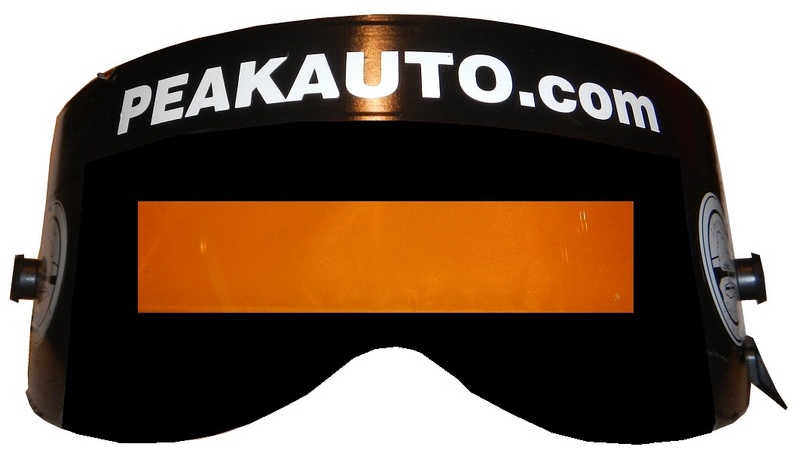 This visor style helps create tunnel vision, and helps keep him focused. 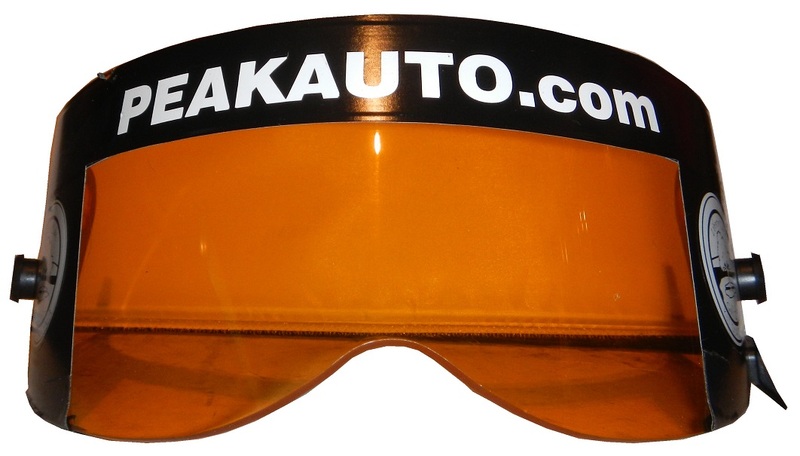 He also said that he blacks out more of the visor, so it looks like this now. Funny cars are the next category. The name came about when drivers would take a regular car, move the front and rear wheelbases forward, and add large tires on the back wheels. Fran Hernandez, who at the time was head of Mercury’s racing program is credited as the first person to call them funny cars, doing so in 1965. Funny cars are, like top fuel dragsters, nitromethane powered, but these cars are only 8,000 horsepower. The driver suits and helmets are identical in design to top fuel driver suits. Older helmets, such as this Cruz Pedregon model from 2011 have respirators built into them. Since the engine is in front of the driver, breathing in fumes is a concern. However with the new modifications to the cars, these respirators have all but disappeared from the sport. Pro stocks are next. Pro stocks are 1,300 horsepower, the engine has to be made in the same place as the engine, and use 118 octaine racing gas, instead of nitromethane. Because no forced induction can be used in pro stock, such as turbo charges, superchargers, or nitrous oxide, the cars are very technical. 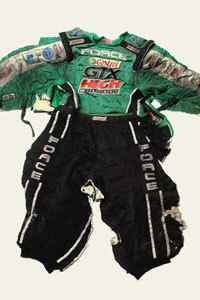 While pro stock drivers tend to wear the same basic driver suits, many drivers choose to wear two-piece suits instead of one-piece suits. I’ve never seen that in NASCAR, IndyCar, or F1. The last class we will cover is pro stock motorcycle. Pro stock motorcycles are rated at around 375 horsepower, are designed to look like their street counterparts, and the handlebars can’t be used to turn the bike. 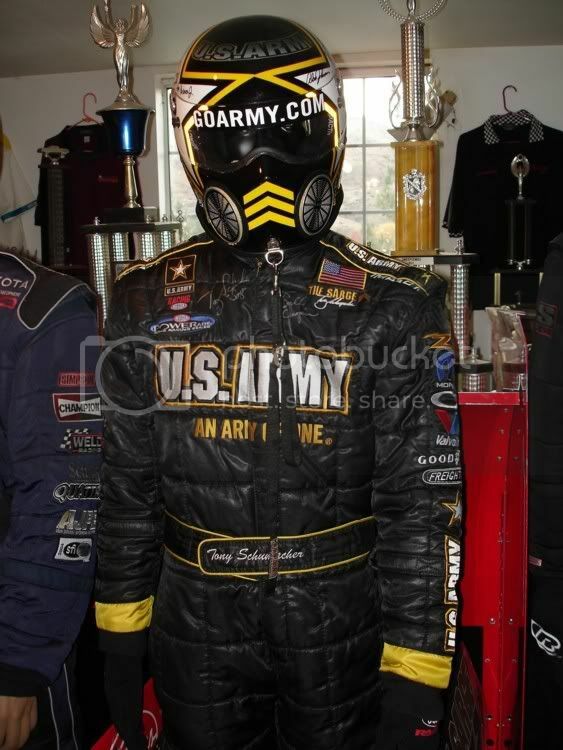 These uniforms are unlike any other uniform in drag racing, in that fire protection is not their major design function. If something goes wrong in pro stock motorcycle, the rider will most likely be thrown from the bike. As such, the riders wear traditional motorcycle leathers, so that if the worst case scenario happens, the rider won’t be skinned alive. 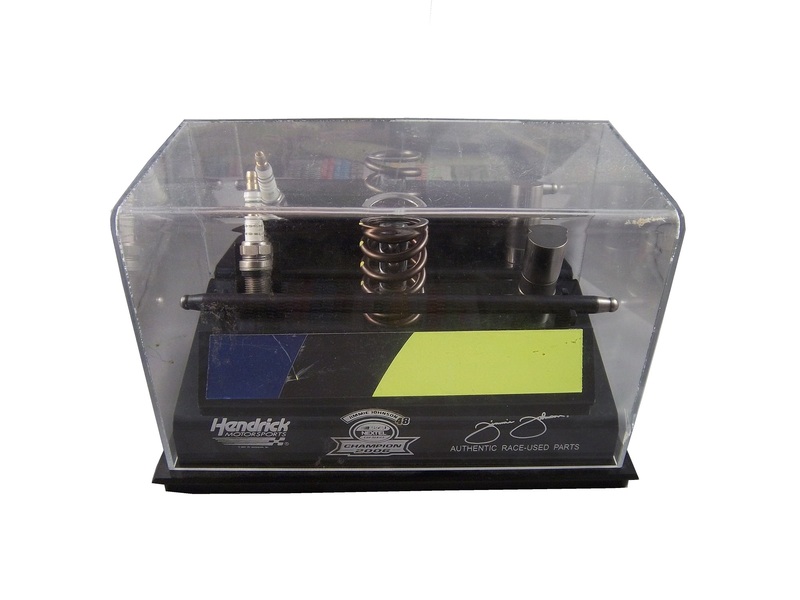 As with all auto racing classes, safety is fluid, it’s constantly changing. After Scott Kalitta was tragically killed in Englishtown in 2008, a controversial decision was made that due to the power and speed that top fuel and funny cars create, they would lessen the length of the race from a quarter mile, or 1,320 feet to 1000 feet. This hasn’t sat well with fans, but has saved lives in the long run. One of the most critical safety features led to the current safety culture. All top fuel and funny car drivers use t-shaped parachutes. 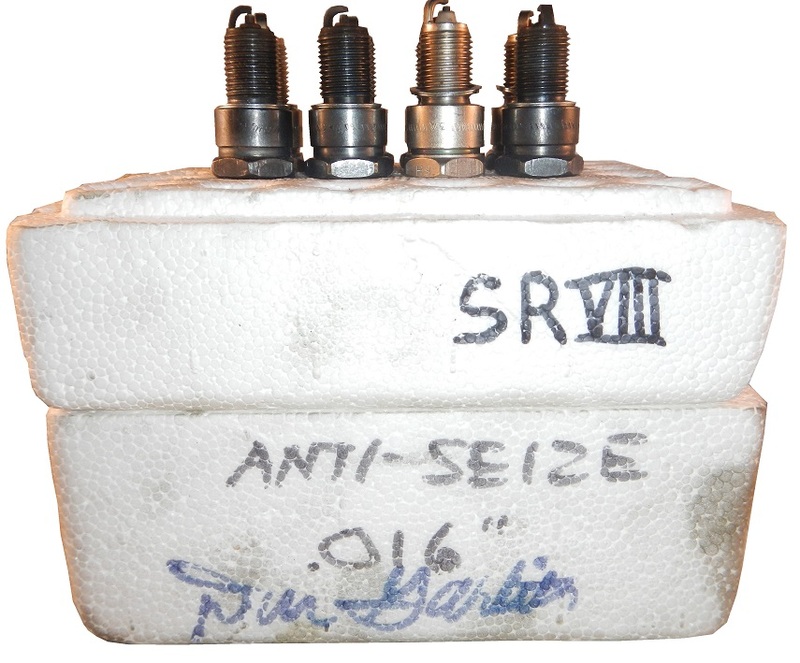 These were invented by Bill Simpson after a drag racing accident. This led to him working with NASA as a parachute consultant. 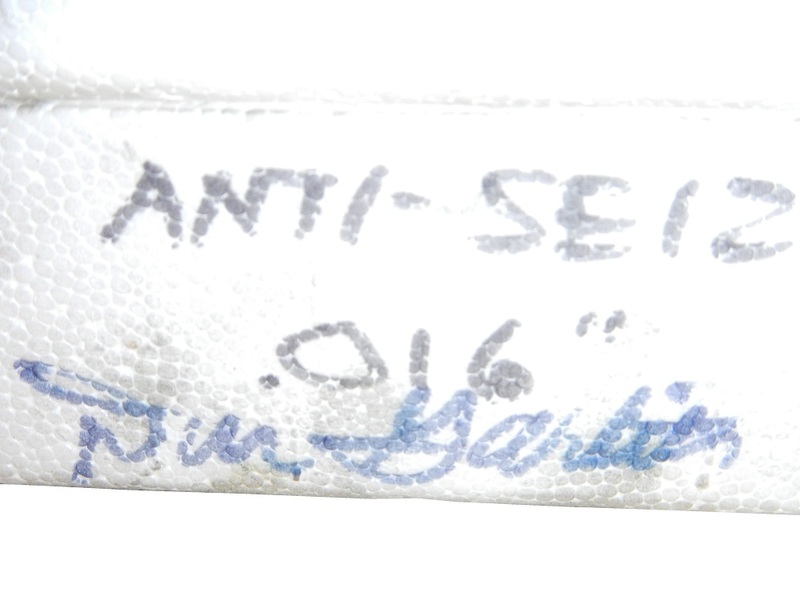 As fate would have it, he ran into Pete Conrad, who was a racer when he wasn’t an astronaut. 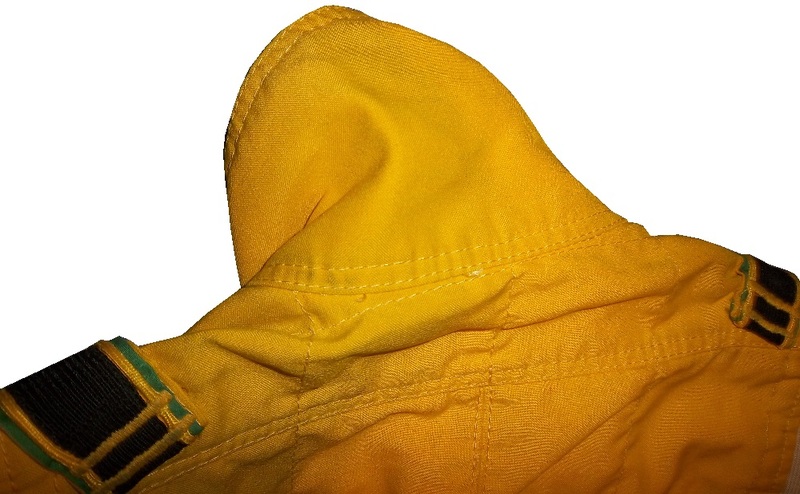 Conrad introduced Simpson to a material used for parachutes called Nomex. 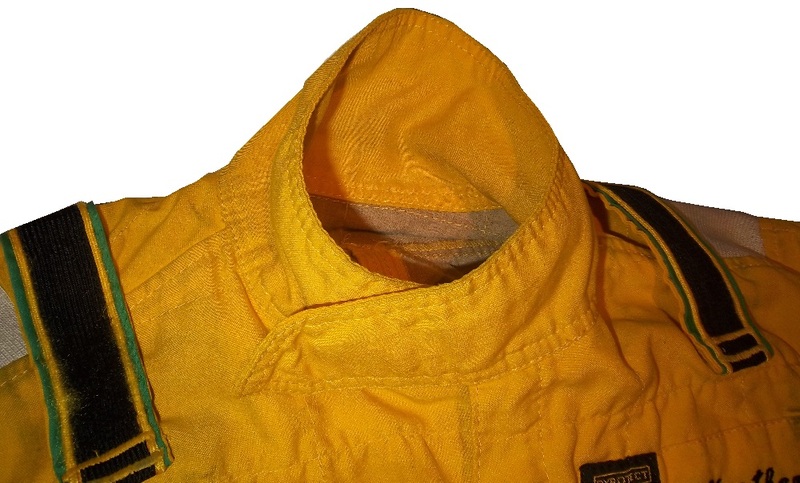 Conrad suggested that it would be a great material for driver suits. Simpson agreed, and the rest is history. 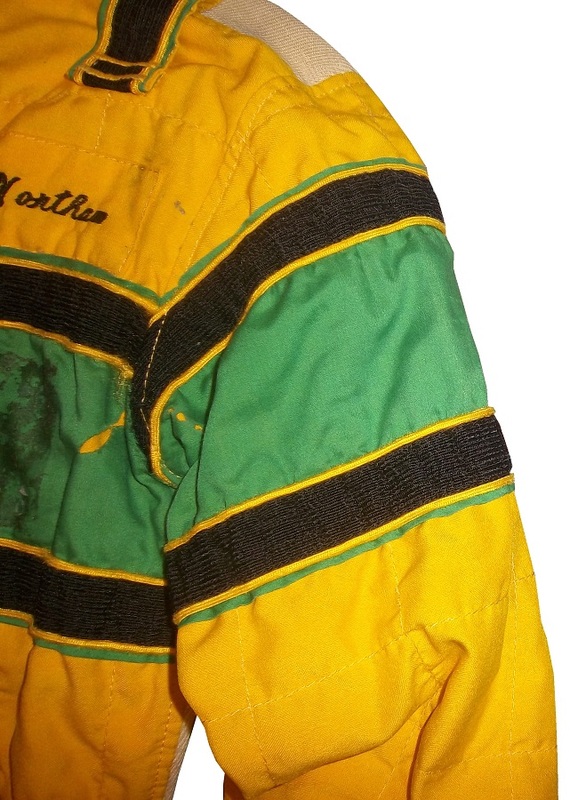 A vintage Bill Brach driver suit, circa 1972 will be discussed this week. 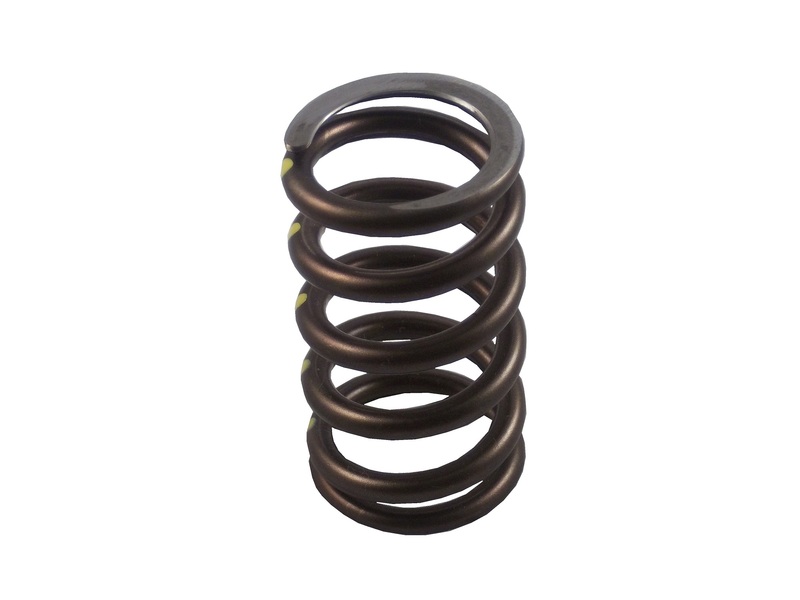 We are in the midst of March Madness, the NCAA Basketball tournament. The big story in sports is the tournament, and if Kentucky can go undefeated for the season. As of right now they are 35-0 and if they win, they will be 40-0. Can I ask a real question? Why do we still think college sports are anything except a cash grab for the schools and the NCAA. It’s general knowledge by now that the NCAA is a cartel. They were formed to prevent injuries in football in 1905, but have since become the overseer of all of the top collegiate sports in the country. They regulate themselves and police themselves with little outside interference. Basically the foxes have been guarding the hen house since the beginning. They want the outside world to believe that they take the regulation seriously. But this non-profit group cares a lot about profits. The NCAA takes in billions of dollars, pays no taxes, and has insane rules concerning how the players are treated. An athlete on scholarship may only be given, under NCAA rules, room and board, and tuition. The athletes are basically make the schools and NCAA money, but they get nothing. Their names and likenesses are used by the NCAA for profit, but the students get no compensation. They are trying to get to the professional leagues, but only 1% of them ever will. The schools can’t even give the athletes things they need. There was a case where an NCAA hockey player had his watch stolen out of his locker. The coach bought him a new one, and both were suspended for a rule violation. I’ve already stated my opinions on their penalty enforcement, so I won’t repeat myself. I’m just sick of this hypocritical approach to finances in college sports. I don’t watch college sports, I never have and I never will, until the NCAA changes its rules. The Weekend Warrior…An Incredible Assett to Racing. 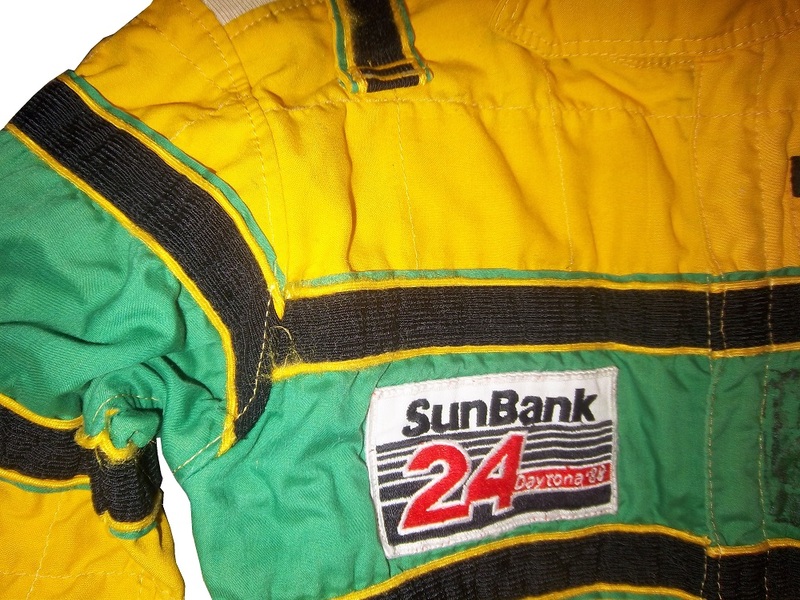 We’ve talked a lot about many subjects, but let’s get back to…DRIVER SUITS! Yes I know, it’s been a while, but we’re getting back to business! Let’s get started. A lot of race car drivers aren’t full time professionals, but are weekend warriors who race for the love of the sport. Some are be involved in the auto industry, some aren’t. For some, they left the sport and started a business. Nort Northam is one of those people. He is a consignment auto dealer who is also a racer. 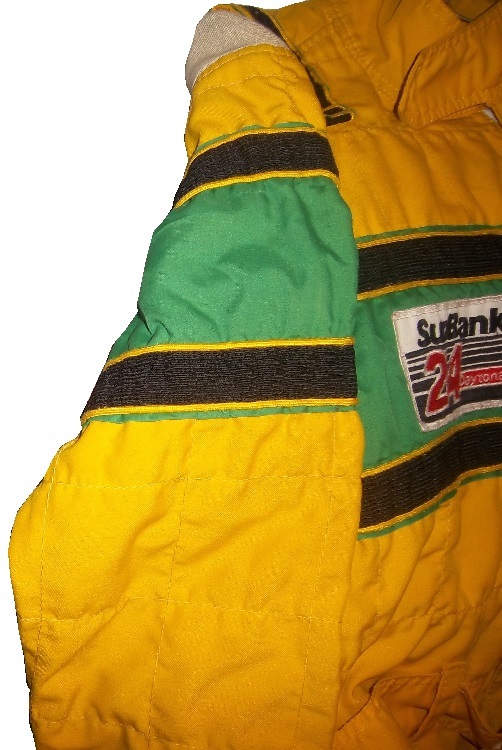 He likes to race in endurance racing, and he raced in the 1988 Sunbank 24 at Daytona, now the Rolex 24. Racing a Porsche 911 with Karl Durkheimer, Monte Shelton, and Jim Torres, he started 67th on the grid and finished 33rd. 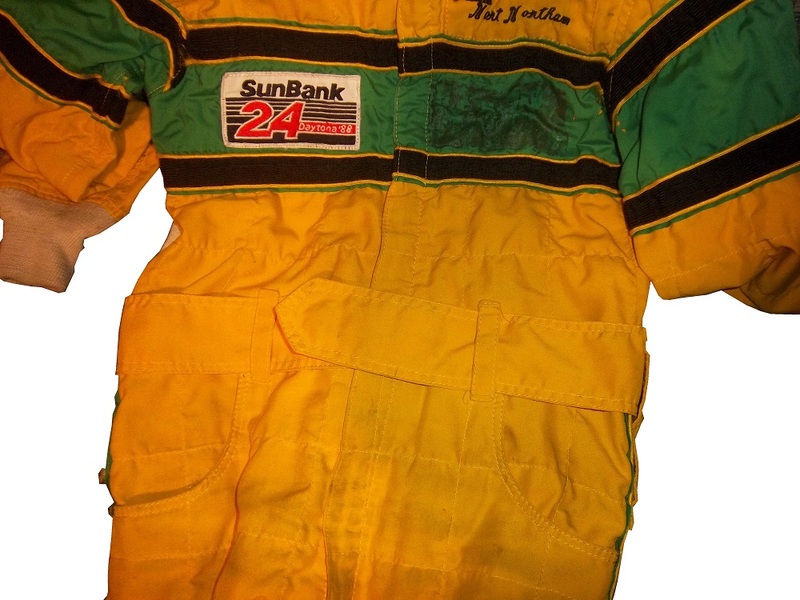 During that race, and for a few races after that, he wore this single-layer driver suit. 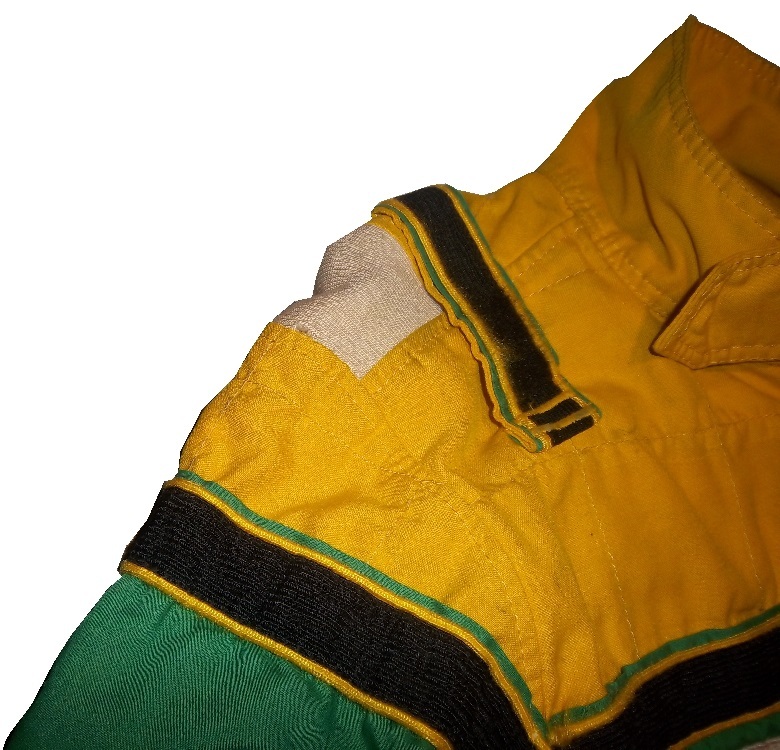 The suit shows heavy use, with stains and scuff marks. 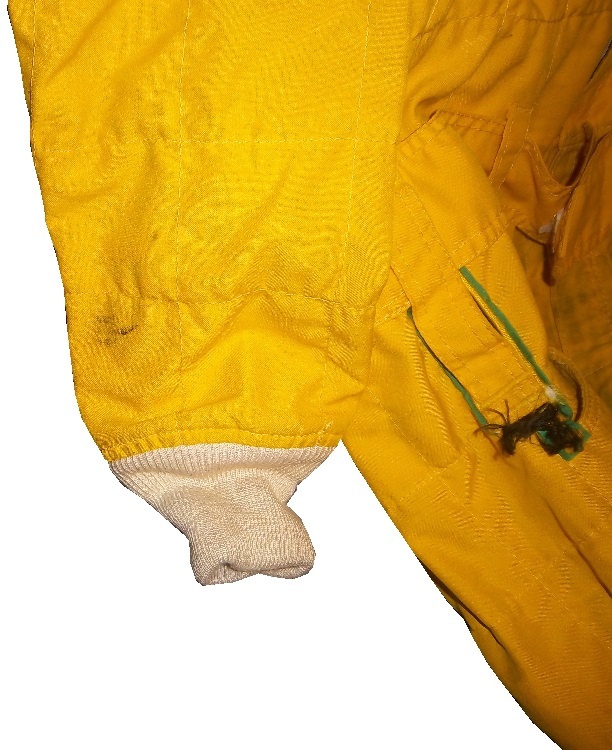 The suit was made by PBI and has a collar behind the Velcro-shut collar. 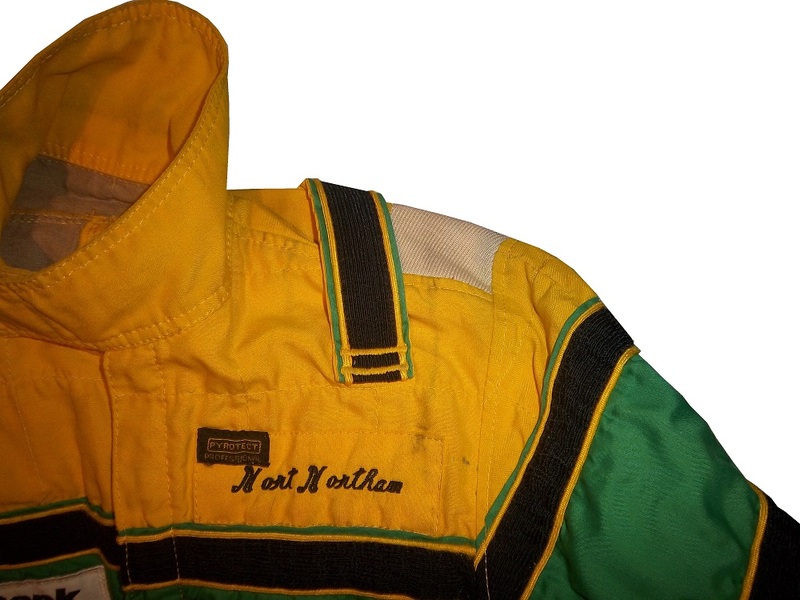 The front has had a patch removed on the left side, and has a SUNBANK 24 AT DAYTONA patch and has NORT NORTHAM embroidered in chain-stitched lettering. The belt us unadorned, the legs have a lot of wear on them. The shoulders have safety straps on them. 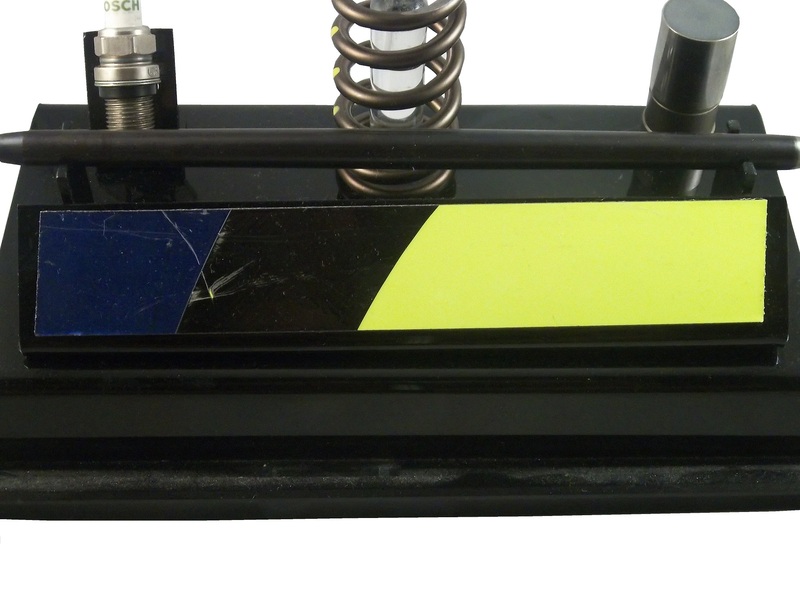 They are cloth strips designed to help pull an incapacitated driver from a damaged race car. They are black so they are visible on the yellow background. It doesn’t look elegant, but it does the job. 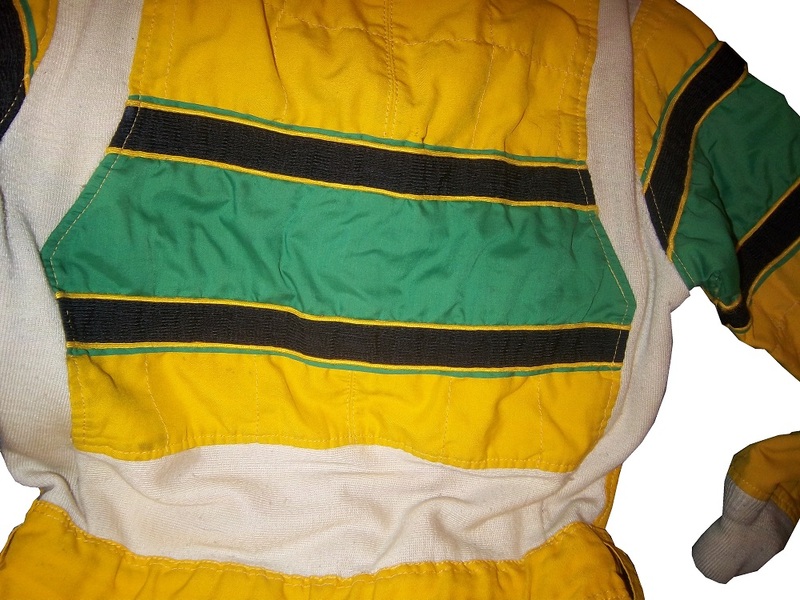 The sleeves have the same stripe design as the front, and have white cuffs. 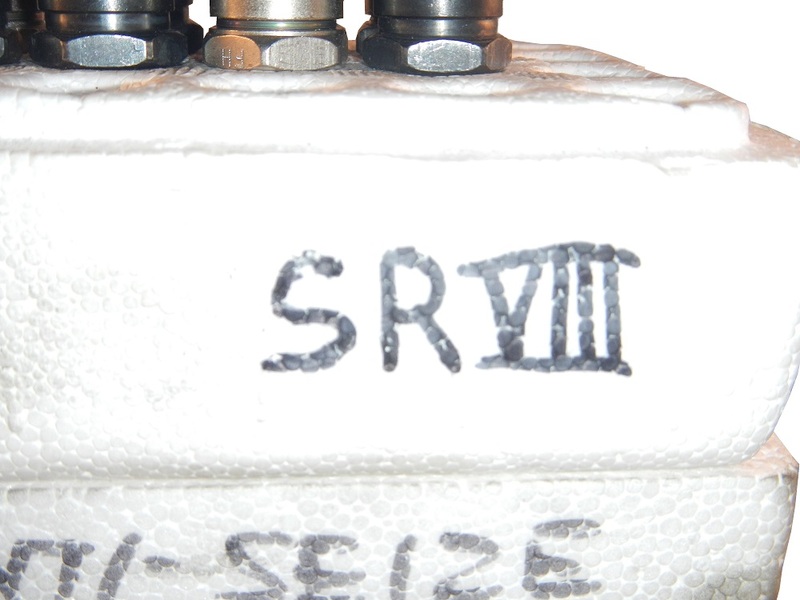 The back design has some white material designed to give some slack to the suit. As the suit doesn’t have arm gussets so this is the next best thing. 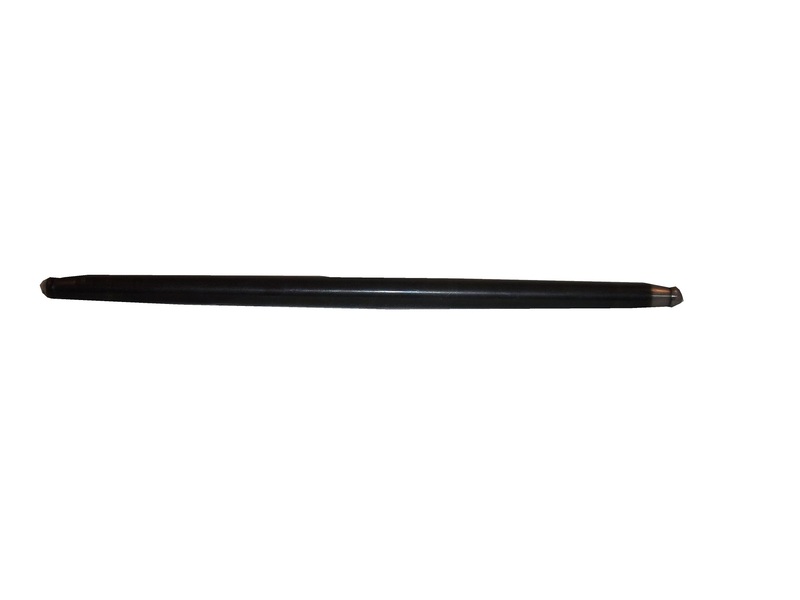 The weekend warriors are an essential part to the motorsports industry. While many racing part companies work with the top teams, they also sell to the weekend warriors who race at local tracks, and the occasional regional event. Next week, we will discuss the driver suit as fashion. Brad Keselowski #2 Miller High Life Ford Fusion–Based on the design that Bobby Allison won the 1983 Sprint Cup Championship. Sam Hornish Jr. #9 Camping World/Medallion Bank Ford Fusion-New sponsor set for 2015, a redesign of the Fresh From Florida #43 scheme. Ricky Stenhouse Jr. #17 Fifth-Third Bank Ford Fusion–Same color scheme as 2014, but with a new, simpler side design. David Ragan #18 Snickers Xtreme Toyota Camry-New scheme for 2015, brown with a series of fades around the Xtreme logo. 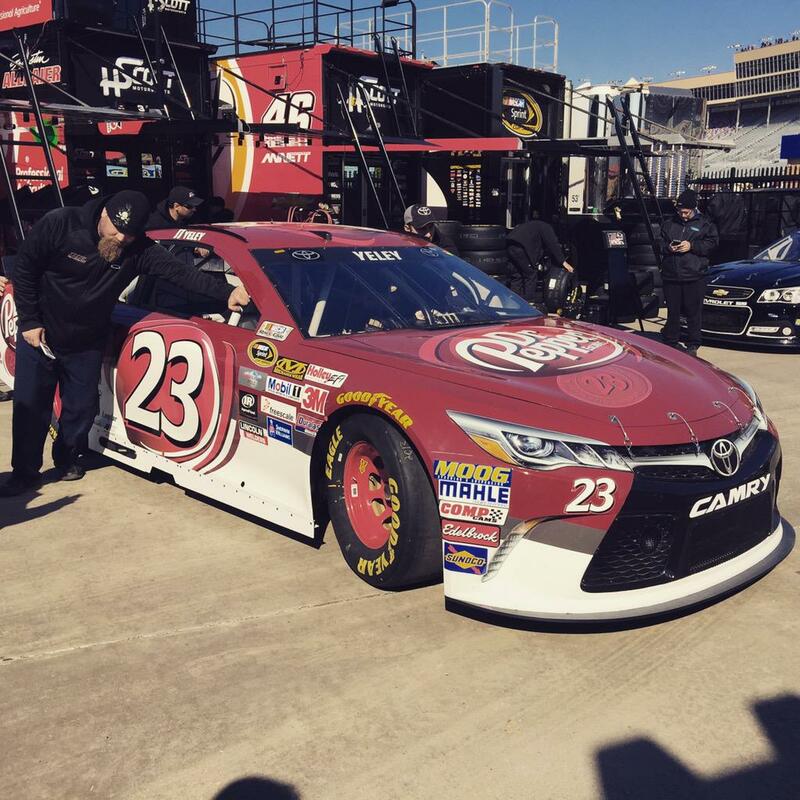 JJ Yeley #23 Dr Pepper Toyota Camry–Slight redesign for 2015, car keeps the red on top, new number design, and white on bottom. Jeff Gordon #24 Axalta/Fix Auto Chevy SS–Same basic Axalta scheme, but with Fix Auto on the side. Jeb Burton #26 Maxim Toyota Camry-New sponsor for 2015, white with black lettering. 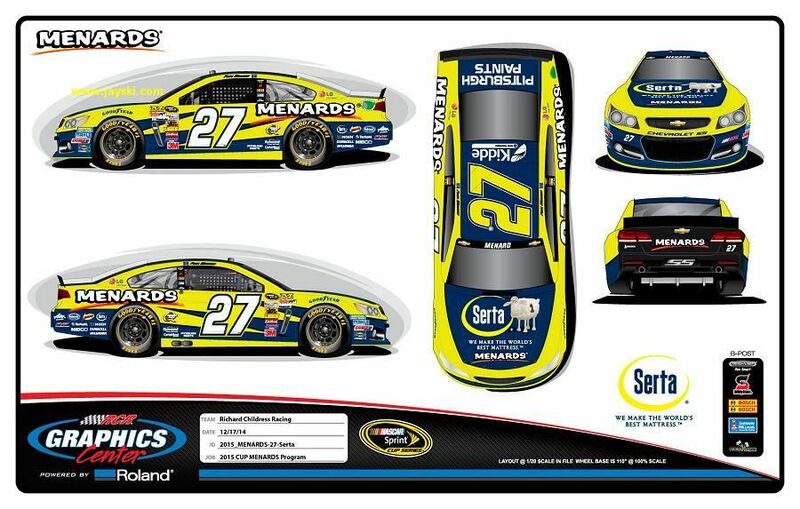 Paul Menard #27 Menard’s/Duracel Chevy SS–New scheme for 2015, using a black, yellow, and gold version of the Menard’s template. Paul Menard #27 Menard’s/FVP Chevy SS-New sponsor for 2015, standard Paul Menard Template with silver designs for FVP. Mike Bliss #32 Draft Demons Ford Fusion-New sponsor for 2015, red and black diagonal stripes with a fire motif at the bottom. Mike Bliss #32 King Taco Ford Fusion-New sponsor for 2015, red, gold and white, with a circular design on the sides, and vintage lettering on the quarter panels and hood. Brian Scott #33 White Tail Lodge Chevy SS–No change. David Ragan #34 Southern Belle Seafood Ford Fusion-New sponsor for 2015, blue, white, and red, follows the “Front Row Motorsports Template” with a stripe that curves above and around the door number, that separates the colors of the car. Cole Whitt #35 Rinnai Filters Ford Fusion–Same scheme as 2014, different team. Cole Whit #35 Sprouts Ford Fusion-New sponsor for 2015, red and blue, with a fruit design on the side. David Gilliland #38 MDS Ford Fusion–Same scheme as 2014, but different team. 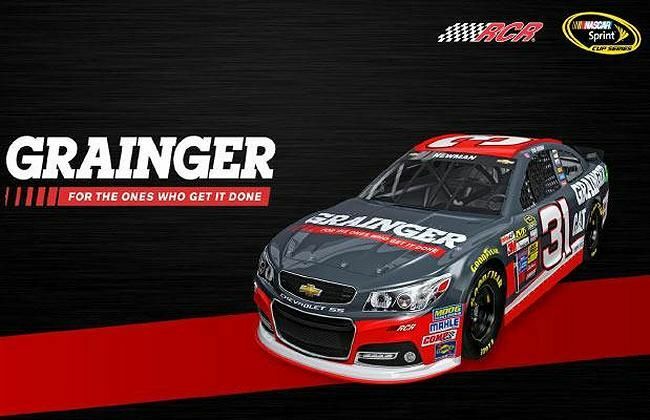 Kyle Larson #42 Energizer Eco Advanced Chevy SS–New scheme for 2015, different stripe color, fewer logos on the side. Michael Annett #46 Cypress HQ Chevy SS–New team for Cypress in 2015, some slight stripe changes on the quarter panel, and a darker blue. Jimmie Johnson #48 Lowes Pro Services Chevy SS-New design for 2015, same as current Lowe’s scheme, but with PRO SERVICES written on hood and quarter panels. Matt Dibenedetto #83 Burger King Toyota Camry–Slight redesign for 2015, black takes over as primary color, Dr. Pepper design around door numbers. I’ve stated my stance on the subject many times, but I’ll say it again, domestic violence, in all forms is TOTALLY UNACCEPTABLE! While Kurt isn’t going to be criminally charged for domestic abuse, it is clear that the incident did occur as accused. A Dover judge issued a no-contact order and stated that it does appear that a domestic assault did take place. NASCAR responded quickly by suspending Busch just before the Daytona 500. I gave them credit for that, but the fact that he was reinstated the second it was announced he wouldn’t be criminally charged makes it clear that NASCAR was, to some extent, caving in to fan pressure. There is no other logical reason why he was reinstated. While NASCAR may have regulations they have to follow, neither I or The Driver Suit Blog are under those same restrictions. While Kurt might have gotten off somewhat easy from NASCAR, I will not be so compassionate. 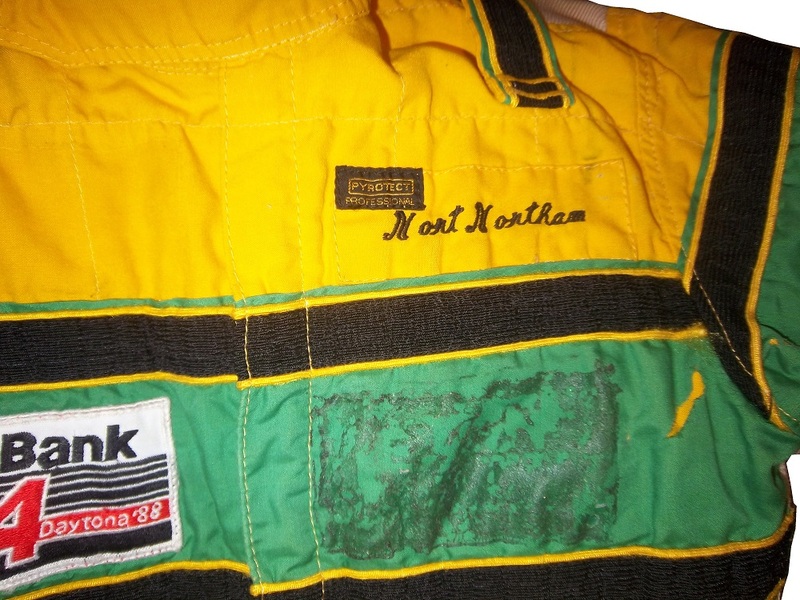 As such, this will be the last time I mention Kurt Busch by name on The Driver Suit Blog in any form in 2015. Above and beyond that, the #41 team’s paint scheme grades have all been retroactively changed to F-. Furthermore, I will no longer list the #41 in the tracker, nor will I grade anymore of the #41’s schemes. 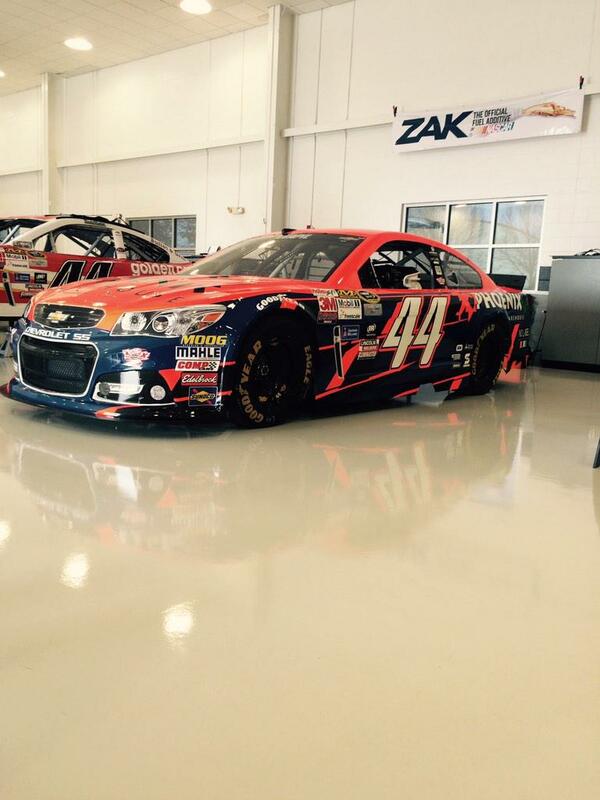 #41 will not be listed on The Paint Scheme Leaderboard, and will be ineligible for the Paint Schemies in 2015. Now that is out of the way, I have something else that I need to discuss. I got an email asking why I didn’t do a season preview for F1. The season started on Sunday, with the Australian Grand Prix. It was a good race, though there was a very high attrition rate of cars. I’ve stated before that I don’t like doing season previews, and it dawned on me, why should I waste time doing things on my own blog that I don’t like to do? So in that spirit, I won’t be doing any more season previews, or season reviews on The Driver Suit Blog. I will do something for Memorial Day, for obvious reasons, but other than that, no more stuff I don’t want to do. I really hated that for a decent part of January that all my Friday Features, which from here on out I will call my memorabilia articles, were focusing on news, and previews. In addition to the Tracker and the Paint Scheme Grades, which aren’t that bad, but at that point in the year, it’s insanely time consuming. I’ve had enough, and I won’t do them anymore. Only fun stuff from here on out. Brad Keselowski #2 Miller Genuine Draft Ford Fusion-An amazing, drool inducing throwback with a great color scheme! A+! Brad Keselowski #2 Miller High Life Ford Fusion– An amazing, drool inducing throwback with a great color scheme! A+! JJ Yeley #23 Dr Pepper Toyota Camry– Good color scheme, good design, but I hate the Dr. Pepper logo on the door numbers, and I’ll give it a B-. Mike Bliss #32 Draft Demons Ford Fusion– The pitchfork and fire design looks really good, and the color scheme is good too, so I’ll give it an A.
Cole Whit #35 Sprouts Farmer’s Market Ford Fusion-It’s a reverse Front Row Motorsports template, which by itself would look good, but the fruit motif adds to it. Factor in a good color scheme and you have an A+ grade. 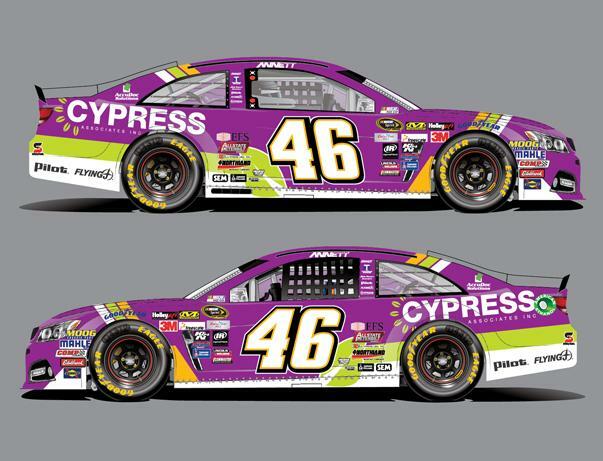 Michael Annett #46 Cypress HQ Chevy SS– Over designed and has a goofy color scheme earns an F every time. Matt Dibenedetto #83 BurgerKing Toyota Camry– Good color scheme, good design, but I hate the Dr. Pepper logo on the door numbers, and I’ll give it a B-. 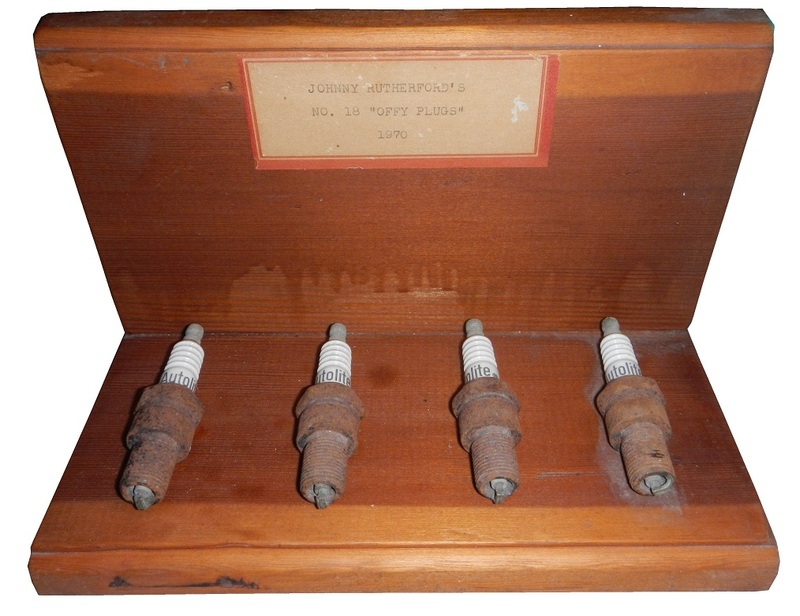 So in planning my article for last week, I got to thinking…spark plugs were the most common race-used memorabilia item for many years. It’s pretty easy to see why. 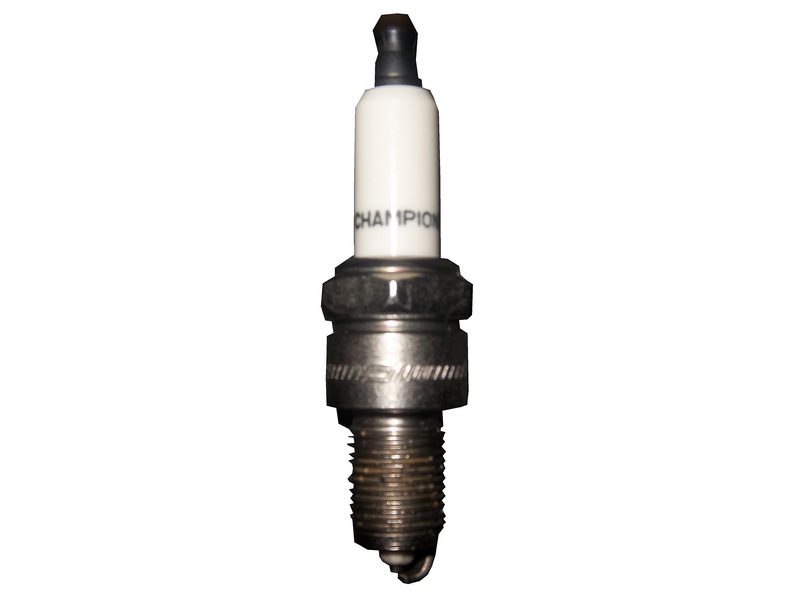 Spark plugs are the most commonly changed part, they are one of the cheapest as well. 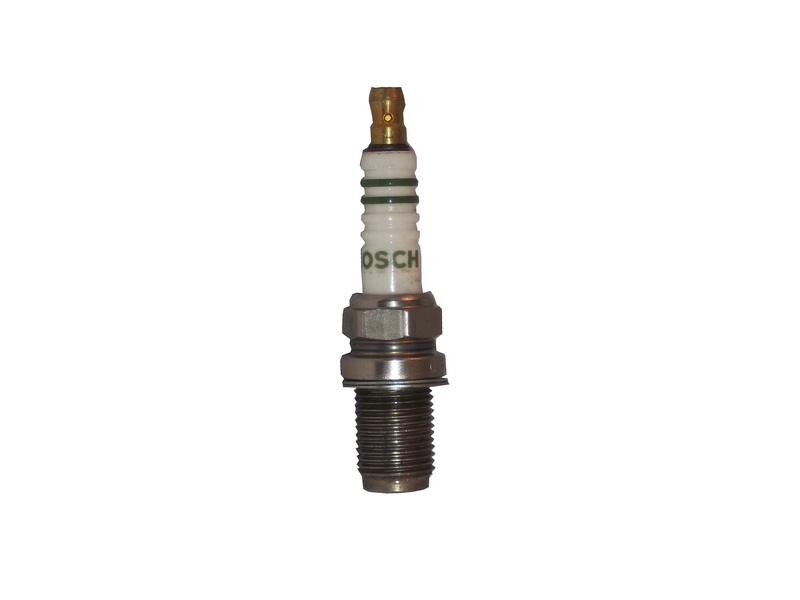 So once the spark plug has expired, instead of throwing out, you sell it to a fan. You get some money, they get a treasured item. In 1970, Johnny Rutherford raced an Eagle chassis with an Offenhauser engine. He didn’t score a win, and had 3 DNS’s. 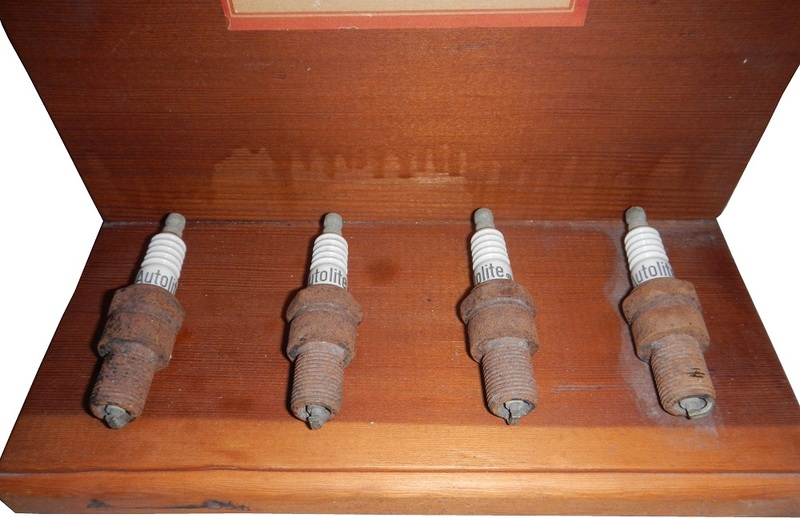 These plugs came from that Offenhauser engine. 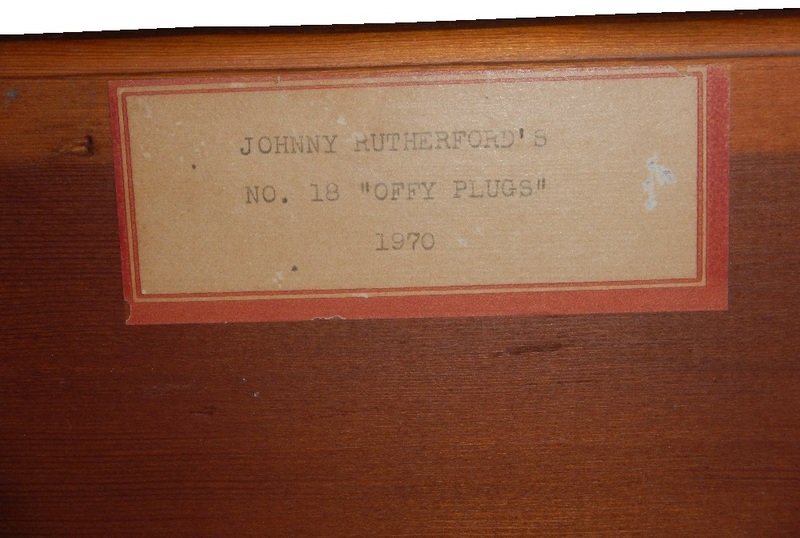 They have been mounted to a wood display, with a small paper sign. 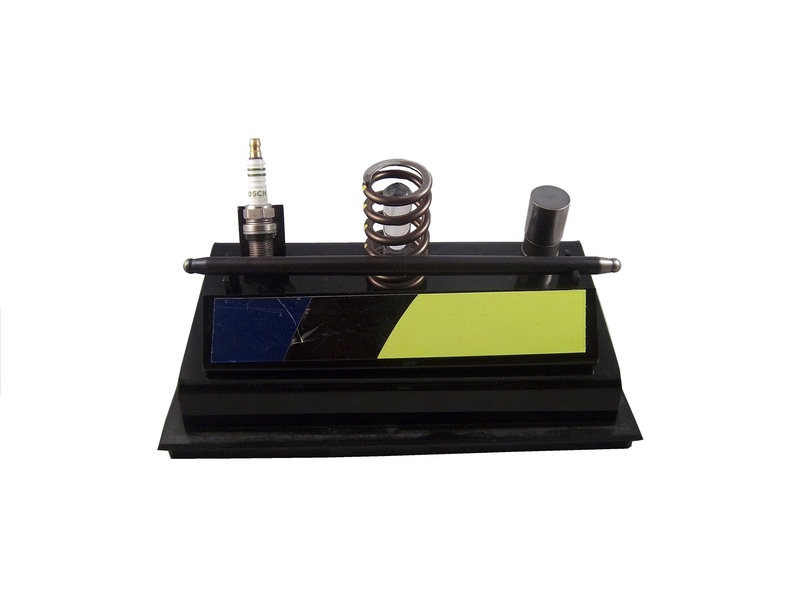 This Jimmie Johnson spark plug is part of a display which features other parts, specifically a piece of the track bar, a lifter, a valve spring, and a piece of sheet metal. 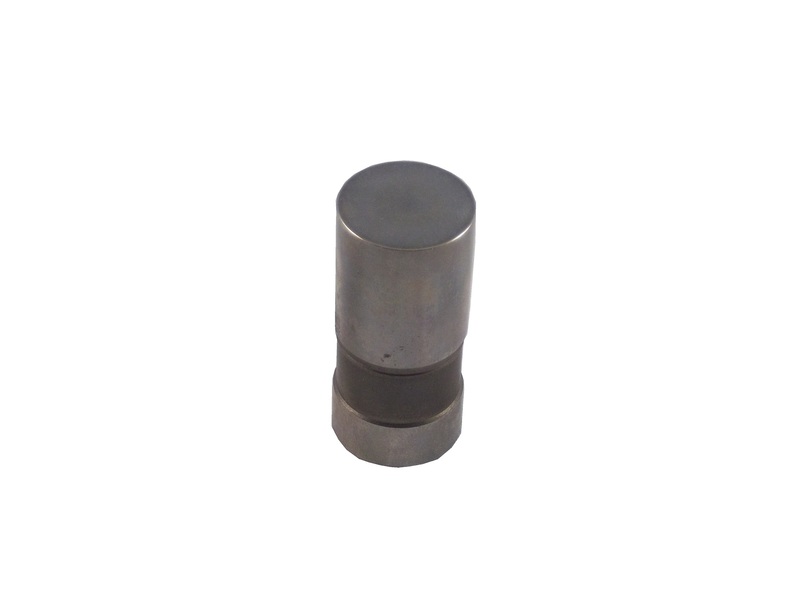 Part of the plug has been modified to make the plug useless.